On August 17, 1785, Connecticut’s first governor, Jonathan Trumbull, died. A merchant, judge, and politician, Trumbull held the distinction of serving as the colony’s 28th governor prior to the American Revolution and then serving as the state’s first governor after. Trumbull saw Connecticut through one of its most challenging times; his service, and that of his heirs, to the state left a mark on Connecticut and its place in the new nation. 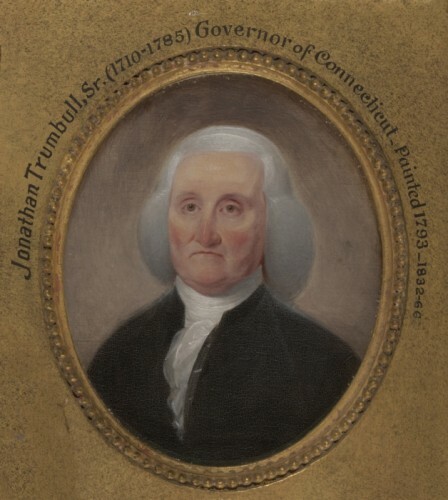 Born in 1710 to a merchant family in Lebanon, Trumbull’s political career began after being elected to the Connecticut General Assembly in 1736. He became deputy governor under William Pitkin in 1766 and then governor upon Pitkin’s death three years later. During his tenure as the colony’s governor, Trumbull was known for keeping an even temperament while mediating disputes and for the way he rallied Connecticut residents to supply provisions for the Continental army during the Revolutionary War. After the end of the war, Trumbull fell into disfavor with the public. His penchant for raising taxes during the Revolution became a liability after its conclusion, and by 1784, having exhausted his political clout, he was forced to retire. Private life provided little comfort to the former governor, who had lost family members during the war years and who still dealt with tremendous debts acquired during his earlier years as a merchant. A number of Trumbull’s children went on to have successful careers. His oldest child Jonathan became governor of Connecticut, while youngest son John became a famous painter. The third Trumbull to attain Connecticut’s highest political post, Jonathan’s grandson, Joseph Trumbull, won the gubernatorial election of 1849. “Governor Jonathan Trumbull House.” Connecticut Daughters of the American Revolution, 2016. Link.